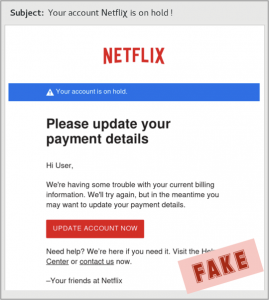 Netflix Phishing Scam - PC Works Plus, Inc.
With this scam Cyber Criminals are not just looking to steal your username and password, they are looking to grab your credit card data, your picture and your ID. 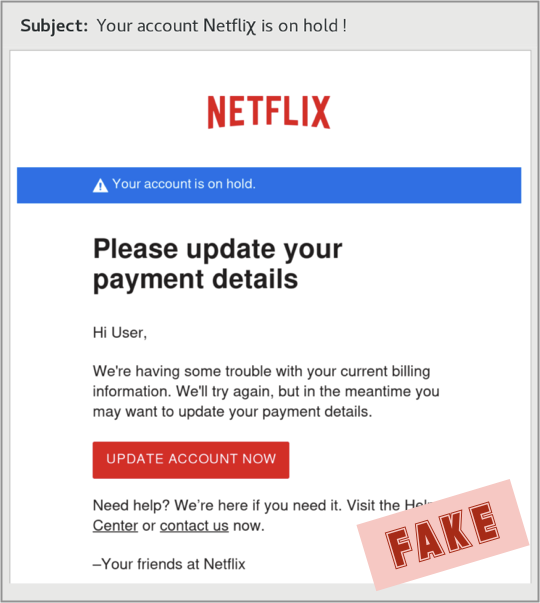 This scam starts out like a typical phishing scam by sending you an email telling you that your Netflix account is on hold and that you need to “Update Account Now”. When you click on the link you are presented with a page to login to Netflix. Of course this isn’t actually Netflix, but a fake page to steal your credentials. Once you “login” you need to enter you Credit Card info. If you make it past that it’s not over…. Now they ask you to “verify” your identity by uploading a picture of YOU holding up your PHOTO ID! Once you do that they redirect you to a real Netflix page to further confuse you. So not only are they stealing your username and password, but also several other pieces of valuable information that they can use.